The Mahindra Scorpio has been one of the largest selling compact SUVs in India. In fact, it was the prefered choice to buyers looking for an urban SUV which does not shy away if taken on the beaten path. However, its sales started to show a bit of flack when new and premium players started to arrive on the market. With the 2018 update, Mahindra has tried its best to give the Scorpio a premium touch and keep it up with the competition. In this report, we tell you all that you need to know about this SUV. Read along to get complete details. The new 2018 Mahindra Scorpio facelift carries minor cosmetic changes both on its exterior and the interior. The exterior gets a Jeep Compass-like grille, updated bumpers, new fog lamps, and a set of new design alloy wheels. Also, the rear door misses out on the black plastic cladding. The interior gets a new upholstery. Top-end trims get faux leather, even on the steering wheel and the gear lever. Also, there a new roof-mounted sunglasses holder. Other than this, there is absolutely no change in the interior. Specifications see a major update in the form of the 2.2-litre Diesel engine from the XUV500. However, this engine is available only on the higher trims. The new motor for the Scorpio outputs a maximum power of 140 BHP and peak torque of 330 Nm. The engine comes mated to a 6-speed manual transmission. 4wd is optional. The Scorpio has been among the oldest players in the segment. It has also significantly contributed towards Mahindra’s overall sales figures in the passenger car market. In its hay days, the Scorpio was seen stealing away all the limelight from the Tata Safari. However, the onslaught of smaller SUVs, like the Renault Duster, and more recently, the Hyundai Creta, saw this Mahindra SUV losing out to the new competition. All this could change with the advent of the new 2018 Mahindra Scorpio facelift. Prices of the new Mahindra Scorpio 2018 start at Rs 9.97 lakh and go all the way to Rs 16.01 lakh mark. The top-end model offers the 140 bhp motor, 4wd, and many features. However, this SUV is yet to get Android Auto or Apple CarPlay. While the new Mahindra Scorpio facelift 2018 doesn’t get too many updates for the exterior and the interior, the higher trims receive a significant update under the hood. The new Scorpio gets the same 2.2-litre unit that powers the XUV500. This 2.2-litre outputs a maximum power of 140 BHP along with a peak torque of 330 Nm. The engine comes mated to a 6-speed manual transmission. 4wd is optional. Even though the 2018 Scorpio will get a more powerful engine, it doesn’t look like the mileage would see much of a change. This will be because the motor will benefit from the Intelli-Hybrid mild hybrid system from Mahindra. Even the XUV500 comes with this system. It is expected that the new Scorpio will offer almost the same mileage as the XUV. All the means that we can expect an average mileage of around 13 kmpl in city and up to 17 kmpl on the highway. While the Scorpio will get many styling changes, the original design and dimensions will remain the same. This means that the SUV will continue to measure 4,456mm in length, 1,820mm in width and 1,995mm in height. The wheelbase will measure 2,680mm. Even the ground clearance, at 180 mm, will remain the same. The Scorpio enjoys a fuel tank capacity of 60-litres. 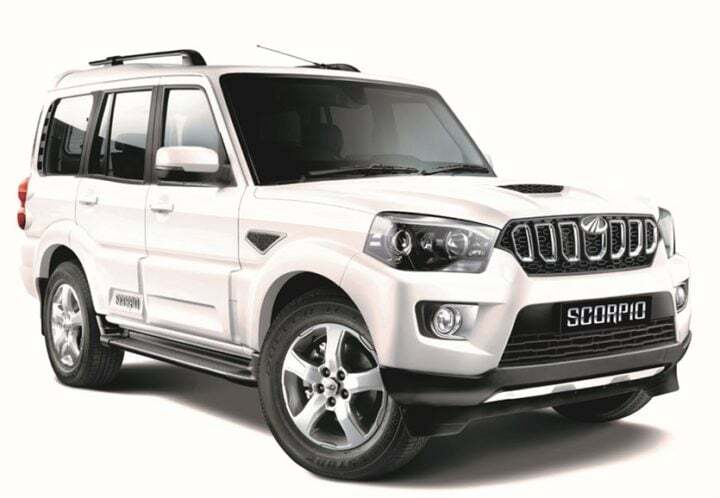 So, are you waiting for the launch of the new 2018 Mahindra Scorpio facelift? Do you think the SUV would be able to justify a small increase in price through the additional features and more power? Share your views with us by pinning them down in the comments section below. Also, stay tuned to Car Blog India for latest news updates on cars and motorcycles in India.